Even though Chiidax is not on public exhibit right now, he's already made a big impression! We announced his arrival just last week, and he quickly became a darling on our social media pages, like Facebook. He's currently settling in and getting to know the trainers at our off-site holding facility in Quincy. Soon enough, he'll head behind the scenes on Central Wharf to get to know the other animals—like Kit, the fur seal pup born here in August. Visitors can expect to meet him late next month. This fur seal pup turned up in the box on the doorstep of an Alaskan Fish and Wildlife office. He was cared for and fattened up in a wildlife rescue facility in Seward, Alaska. 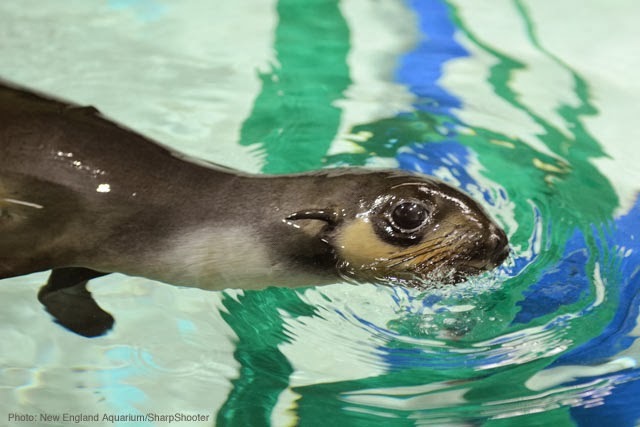 Once he big and healthy enough to travel, he made the long journey back to New England, escorted by an Aquarium veterinarian and marine mammal trainer. Chiidax (pronounced Chee-dax) has quite a story. But we're happy to say that he's home for Christmas! Hope you and your families and friends are enjoying a lovely holiday season. You can help! 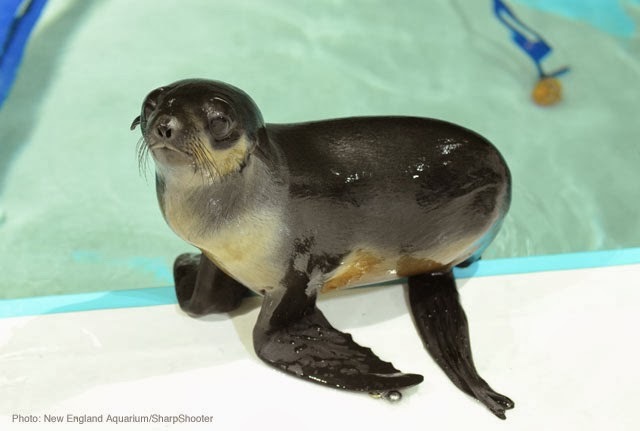 Support the Northern fur seals at the Aquarium through our Animal Sponsorship program. You'll help pay for food and medical treatment for this rescued animals, as well as the pups born here at the Aquarium.